Are you looking for a destination for your holiday? Try to consider these ten places like suggested by Mother Nature Network. Not only giving you the experience, but you will also be able to take surreal pictures that will give you more likes in Instagram than before. Located in the border of Arizona and Utah, the beautiful formation of sandstone will make you think that this is a movie set. While actually this place is naturally formed by the infrequent runoff that eroded the Navajo Sandstone formation. 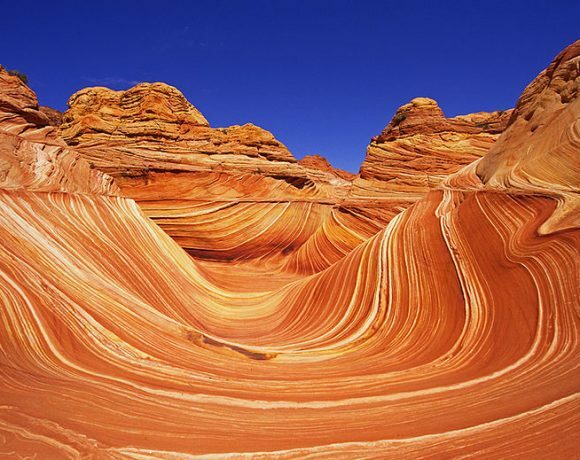 Unlike other erosion that cut through the sandstone, the erosion in Coyote Buttes is not enough to cut it into two, giving the texture and a slope with U-shaped formation. The U-shaped formation then continually being eroded by wind, giving it smoother texture. This place is already famous among professional photographers because of its beauty. So, don’t you want to follow the steps of those photographers who took picture in this area? Near the location of The Wave, there is also another beautiful attraction with another Navajo Sandstone view. 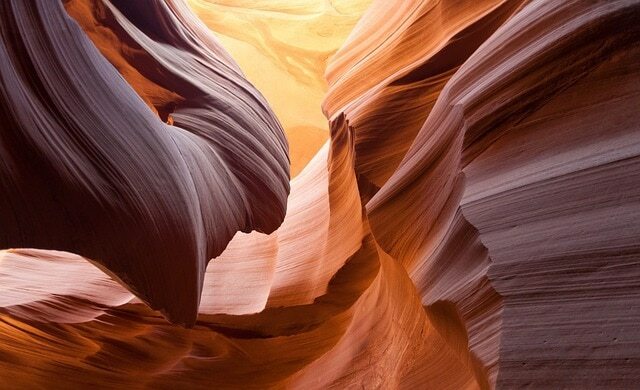 This one is Antelope Canyon that offers two beautiful parts of it, the upper and the lower one. 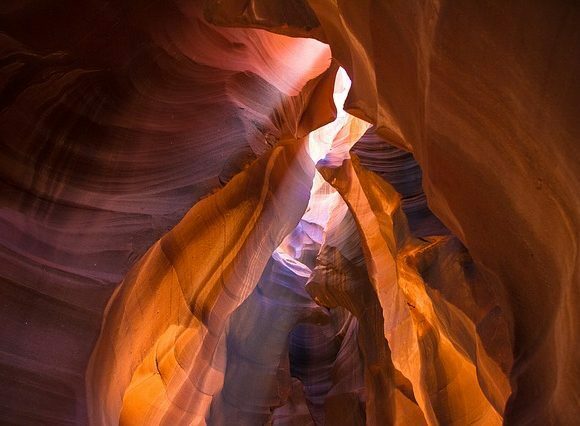 The Antelope Canyon is famous for its lighting reflection bouncing around within its walls and sometimes a show of light beam from the sun. The upper one is more accessible for tourists because it is on the ground level, while the lower part is for those who loves more hiking activity. We have mentioned this site before in one of our article that talks about eternal flames all around the world. 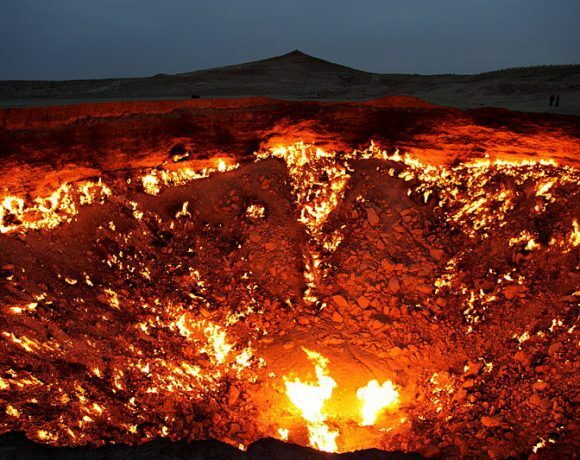 Door to hell is the name of a pit burning from eternal flame that is fueled by enormous amount of natural gas. For about four decades, this place has attracted professional and amateur photographers to take some pictures. This place will give you out of world photographs especially in the night, where the constellation of stars above will be the background of the burning pit. If you love to watch science fiction movies, you may notice some floras in other planets that have weird shapes different from what we usually find. 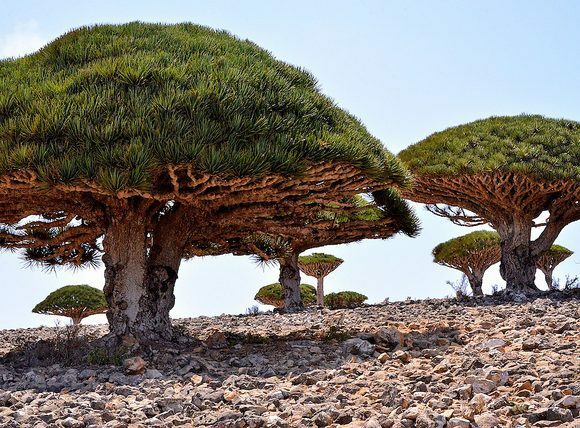 And if you visit Yemen, you might have to believe that actually we also have a weird kind of tree growing on earth. The name is Dracaena cinnabari or as known as Dragon Blood tree. What makes it weird is the shape of the canopy that resembles the shape of a mushroom with reversed top. Aside from its name, it gets its name from the weird red sap that it produces. Overall, this place is a year-long flower park where you can enjoy many kinds of beautiful flowers. 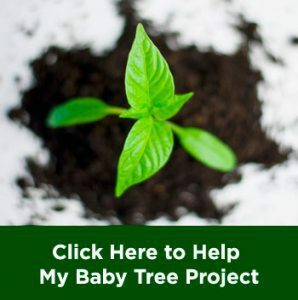 There are so many varieties of flowers and trees to watch and they are all beautiful. But spring is the best time to visit this park. You may have seen many blue flower parks around the world, or maybe you have created your own blue flower garden like we suggested in earlier article. But visiting this park will still amaze you anyhow. A variety of blue flower called Nemophilia or baby blue eyes blooms from late April to May in the Miharashi no Oka. 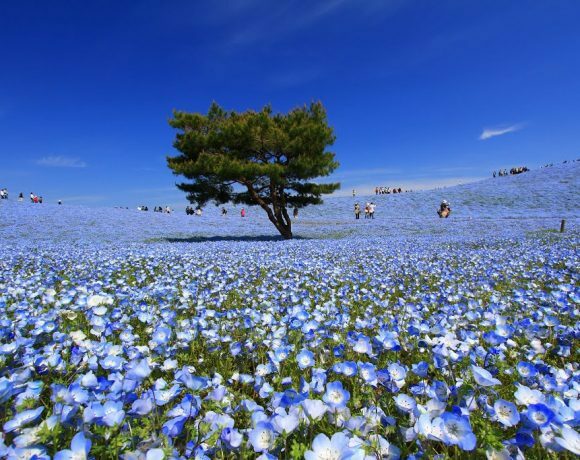 There are millions of this blue flower that grow in spring. And being in the middle of the park will make you feel like being in a anime scene, Japanese famous cartoon. Well if blue is not your favorite color, and you prefer to see more reds, this place is the one that you might want to visit. 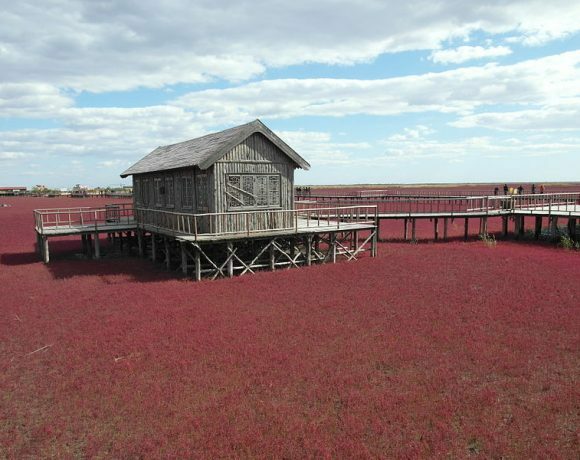 The name itself is derived from the color of the wetland which is covered by Sueda salsa, a kind of weed whose color is red. The amount of the weed on the wetland is so much that instead of sand, it will give you a wide view of reddish land. The color of the weed will be bright red in the autumn, and that’s the perfect time to get surreal pictures for your social media. 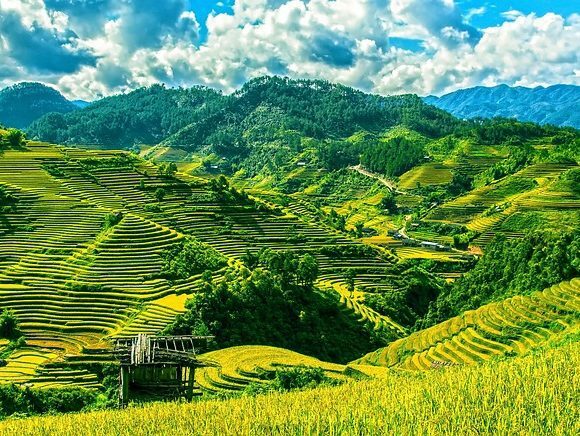 The contour of Bali island makes its people hard to grow rice in traditional way, so the people in Bali developed a way to plant rice in the land. And if neither red nor blue is your color, then maybe the green view of rice terrace in Bali will satisfy your soul. The rice terrace is well known by photographers all around the world for its color and contour. The slopes and gorges, with sometimes a view of Balinese people is both surreal and aesthetic. 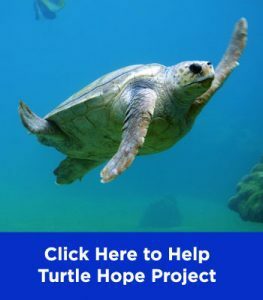 Would be nice to put a picture of it in your social media. Three articles above may lead you to places with different colors as the base. But in this place, all those colors mentioned above can be found in one place, it is Grand Prismatic Spring in Yellowstone National Park, United States of America. The natural spring is 370 feet or more than 100 meters in diameter, making it bigger than any football fields. 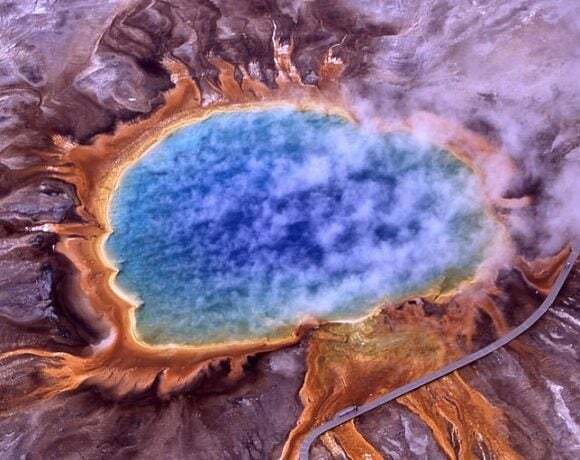 The colors of this spring come from microbial mats around the edges of the spring that results in reddish and yellowish color, combined by the minerals in the water giving the bluish color. From surreal natural landscape, let’s go to a view with human touch. 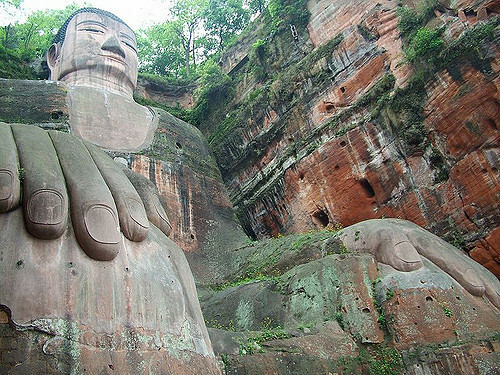 The next destination is Giant Budha in Leshan, China. The statue was made between the early 8th to 9th century during the Tang dinasty, standing (sitting) 71 meters tall. The statue itself depicted the feature of Budha Maitreya. The statue, unlike other statues that were build from rocks or bricks, is carved out of a cliff face. The beauty of this attraction is how nature tries to claim it back. Greenish color from moss growing on reddish statue shows beautiful mixture to our eyes. If you visit the country of Ukraine and stay near the city of Klevan, try to take a train to Orzhiv with nothing to expect. In the way, enjoy the outside view, and you will be surprised with the surreal beauty of the Tunnel of Love. 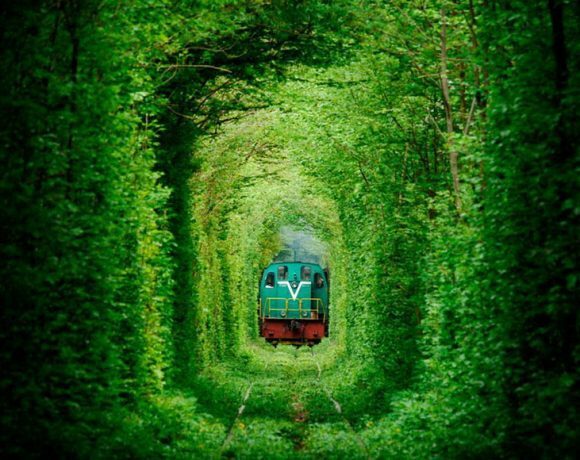 The railway tunnel is covered by green arches, and couples often take a walk inside the tunnel, giving it the name of love. The length is about three to five kilometers long from the whole 6.4 kilometers railway line.